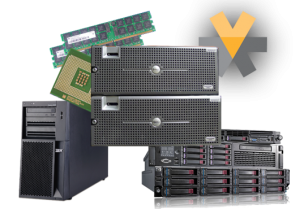 Vibrant Technologies buys and sells new and used servers, guaranteed and backed by certified expertise. Our multi-million dollar inventory of used servers and upgrades. Vibrant is dedicated to bringing quality pre-owned equipment to the global market at deep price discounts. Select from our range of x86, blade and Unix/proprietary server options above. We can configure any system to your specific requirements. When it comes to technology, most B2C consumers are looking for the latest and greatest, but B2B IT Hardware is built to last for years or decades. At Vibrant, we fully test and guarantee every server that comes into our shop, and test it once more on the way out for total assurance. We sell not only legacy systems, but normally have the latest and greatest equipment within a couple of months of release. IT users buying used server equipment are able to gain capex assets at a greatly reduced cost, providing more available funds for opex – more budget for your applications and new hires. As with any technological purchase, ensuring you have all the information is essential to getting the best product at the best price. With thousands of used servers available, we will almost always have excactly the system you require. Request a Quote Now or Contact Us for more information and pricing. Being an early adopter is expensive, especially when the former model already provides double the horsepower and functionality required. For a burgeoning business, or even an established one that wants to maximize expenses, it is difficult to pay twice as much as you should. Businesses that can’t purchase the technology necessary to keep up with their competitors are left behind and being nimble helps you outflank them. Buying used greatly reduces the initial investment in the hardware. It generally only takes a few months for technology to start cycling into the used market, and because technology doesn’t actually update as quickly as we think it does, used hardware still competes with the new models on the market. And because of the reduced prices, you can even purchase a better piece of hardware than you would have originally been able to purchase. The used market is especially great for servers, as the turnover time for servers is truncated (because of how they are used by individuals and businesses) and because they are sturdy pieces of hardware. Only buy used hardware that is guaranteed and backed by a company warranty. Buying from sellers that do not test and provide full warranties for their products is how you will end up with damaged or malfunctioning items. At Vibrant, we test every piece of hardware thoroughly and guarantee that it will work as well, if not better, than anything you could buy new. Most people believe that an outsourced server (that is, hosting all of their information on a server that they do not have to service or house) is good enough for their business. However, in reality, in-house servers are often much more functional for any organization of significant size. A server is a specialized computer, able to store vast amounts of information and programs from many other computers, as well as transfer that information in between computers. Many organizations also use servers as a backup station for the other PCs connected to the server. The main requirement for a server is to have enough processing power to handle all the data requests. For companies with enterprise applications or well-traveled websites, servers will need more storage space and more processing power in order to make the server feasible. Especially for companies that do business online, having an in-house server, large enough to handle the commerce requests, is essential. Having a slow or malfunctioning website is often a death sentence for online companies as consumers develop ever-shortening attention spans and become more demanding. Though businesses most commonly have servers, they are also used in the majority of schools where having a personal network of computers is helpful. Middle school and high school almost always use in-house servers, in order to allow their students to learn how computer networking works, along with the fundamentals of building a webpage and servicing servers. They also allow many different computers to have access to the same printers and scanners. Individuals who run an online business or whose webpages see a huge amount of traffic, often opt for a personal server, preferring the one-time cost of purchase over the month-to-month cost of renting space on an internet server. IT administrators often keep a home lab to build their skills and work on certifications. Because servers are all about how much space you need to have a functioning network, it is always better to have more space than you need, in case that server suddenly has to accommodate more requests. With a personal server, you always have as much room as you need (or installed). When you rent space off of another server, you often have a limited amount of request space. Where Do Used Servers Come From? One of the top questions we get from our buyers, especially the ones who tour our overflowing warehouse, where do all these systems come from? After all, how can such a wide range of recent and legacy systems in amazing condition find their way to Minnetonka, MN? But servers reenter the market in a number of ways, and almost all of them are already in great shape since they were typically in professional data centers and server rooms under a support contract. The most common way servers enter the secondary market is that businesseses sell them – whether it’s a bankruptcy, refresh or consolidation project. They then sell their used servers back into the market. The server is in perfect condition and field tested, it just doesn’t fit the needs of the user anymore. Enough users trade in equipment each day that it leaves us with almost every make and model of server you could imagine. There are also servers that arrive straight from overstock channel and reseller sources, servers which have never been used, but which need to be removed from shelves in order to make room for new merchandise. Whatever the source, you can be assured that they will work just as well (often better than new, because they are inspected and tested in our shop before you get them). As far as processing power goes, there are three kinds of servers, all of which you can find used among our massive selection of equipment. Which server you will end up needing will depend entirely on what you need the server for. There are also three physical configurations for servers. These used servers are usually designed to work for networks of fewer than ten computers. They are great for small companies that just want all their computers to share email, files, and printers. They are not great, however, for businesses expecting heavy internet traffic or sudden increases in information requests to their servers. Because they usually do not have very much growth potential, these servers are avoided by those looking to quickly expand their companies. For routine office work however, to connect a floor of computers or a certain department, these entry-level servers will work perfectly. Midrange servers offer more features, including the ability to stack two or more systems together for more storage and processing power. They also have the ability to physically connect to attach storage devices, furthering their storage abilities. Stacking of these servers is a great way to provide security and stability to your network, as even if one server goes down, there are others fully capable of continuing on while you try to service the malfunctioning one. These are the most common kind of servers, and are also the most common kind of used servers. These servers are designed to handle huge amounts of traffic and data and are typically used by large companies, or even small companies that run massive ecommerce stores. School, banks, large businesses, government agencies, and airlines all use these servers because of their ability to handle large amounts of information. Enterprise servers are also designed to be more reliable and need less downtime than small servers, making them great for companies that want to ensure their websites and networks rarely go down and that customers can always make their purchases. Tower units are upright and free-standing, and often look like enlarged versions of tower computers. Some companies prefer to steer clear of tower servers because they take up floor space, but for small businesses, who only need to connect a few computers, they are efficient models. Any of three above-mentioned server capacities can be found in tower models. These servers can be tucked away in a cabinet or mounted on the wall, meaning that they are more space-efficient. Companies looking to quickly expand their business often opt for rack-mount servers because they can be added to without taking up more floor space. Though rack-mount servers usually have less memory than other kinds of servers, more memory can be installed, or the servers themselves can be stacked, creating a more secure and constant environment for more information. Blade servers are relatively new to the market, and are designed to fit more servers into a smaller space. They also are equipped with a number of great features, including a self-cooling system and the same amount of memory in a smaller package. All types of server capacities are available in all types of physical configurations. In order to pick the best server for yourself or for your business, you simply need to consider what the server will be used for, what kind of space you have to store the server, and how much memory and processing power you need. Companies who simply want a dedicated, personal email server will find that a tower server will serve their needs. Companies with extensive commercial needs, however, will need to consider more powerful servers and how to store them. Rack-mount and blade servers will be more practical for their needs. Any combination of these severs can be found used in our selection. There are many aspects of used servers and their retailers that buyers should investigate before making a final purchase. This will ensure that you get the most practical server for your needs, without paying more than you have to. Before making any purchase, research the reliability of server models and of the retailer you are purchasing from. Whether you need your server simply to network a few computers into the same email and printing system, or you want to run a mission critical business application, you will need a reliable server. Nothing is more frustrating for your employees than not being able to access emails or the central ERP, and nothing is more frustrating for your customers than not being able to access your webpage. Avoid these problems by purchasing reliable servers from the most reliable sellers. Let’s not overstate this though, we’re tallking simple plumbing – servers are built to run for years, especially when properly tested and serviced. There is risk involved in buying any IT asset. Many people believe the risk is increased when purchasing a used piece of hardware, but as long as you purchase from a reputable company that tests and guarantees its resale items, your risk is significantly mitigated, even reversed to a lower risk than new. Vibrant strives to be that company, ensuring that you are getting a product that works like new, without having to pay the high prices of purchasing new servers. The risk of buying outdated hardware is one that continues to push people to pay more for essentially the same equipment from new retailers. Just because a server is a year old, however, does not mean that it has slower processing speeds or less memory than new servers. Buying a used servers often allows you to purchase better processing power and more memory than you would have been able to otherwise, because they are cheaper. As a server hardware specialist and system builder, we understand the needs and concerns you have as a buyer. You want to save money, but you also demand quality. We provide only the best quality used servers, which are sure to serve you for years to come. Unsure of which brand best fits your requirements? The benefit to our multi-vendor approach is that we can help you determine which manufacturer has the best used server model available for your application – Or we can lay out several options so that you can choose without blinders on. Contact us for help. Require a model that is no longer offered by XYZ manufacturer? Great! Our warehouse is stocked with used and refurbished servers, spares and parts that have been discontinued or End of Lifed (EOL) by the manufacturer. We carry this used servers and parts not only to support our maintenance contracts but to fill a need helping those who HP, IBM or Sun has left behind. Please contact us directly or navigate through your brand above and submit an online RFQ for your specific model. Need the latest and greatest but can’t afford new prices? Our clients are frequently surprised by how quickly we can supply discount remarketed used server models right after they’ve just been released – particularly with CPUs, Memory and Disk upgrades. Give us a shot! For more info or pricing on refurbished servers or upgrades, either navigate your preferred manufacturer above and select a model contact us for direct assistance.